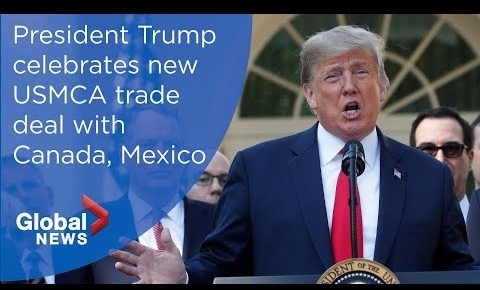 Presented as the United States-Mexico-Canada Agreement (USMCA), many have noted that Trump’s trade deal, as Bloomberg put it, “looks more like a rebranding than a revolution,” despite Trump’s vows when he was a presidential candidate that he would negotiate a new deal that’s dramatically better for American workers. As experts and campaigners comb through the details of the agreement, environmental activists are homing in on provisions they warn would endanger people and the planet. While the agreement, unsurprising, does not mention “climate change” or anthropogenic global warming—including in its chapter on environment—as The Huffington Post pointed out, the deal limits the long-criticized investor-state dispute settlement (ISDS) process that corporate powers have used to override local environmental protection regulations. “It’s like saying, ‘From here on, we’re going to protect the henhouse by keeping all animals away, except for foxes, they’re cool,'” Ben Beachy, director of the Sierra Club’s living economy program, said in a phone interview. Labor advocates such as AFL-CIO trade policy specialist Celeste Drake, meanwhile, called on representatives from all three nations “to go back to the table and finish a deal that creates good, high-wage jobs, protects our environment, and safeguards our democracy.” Although Drake said Monday that “there are too many details that still need to be worked out before working people make a final judgment on a deal,” she highlighted a few alarming elements.